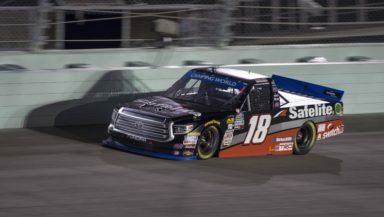 Noah Gragson was looking to end the year on a high note at Homestead-Miami Speedway before he moves up to the NASCAR Xfinity Series in 2019. However, his night went sour with 33 laps to go. A tire issue on his No. 18 Kyle Busch Motorsports Toyota prevented him from winning the championship and the race after a tremendous battle with Brett Moffit. He led twice for 34 laps but had to settle for a third-place finish in Friday night’s NASCAR Camping World Truck Series Ford EcoBoost 200. Gragson finishes the season with one win, nine top fives and 18 top 10 finishes. Next year he will move to the Xfinity Series, replacing the retiring Elliott Sadler, at JR Motorsports.